This book of ten original essays provides a showcase of currently diverse theoretical agendas in the field of international relations. Contributors address the theoretical analysis that their perspective brings to the issue of change in global politics. 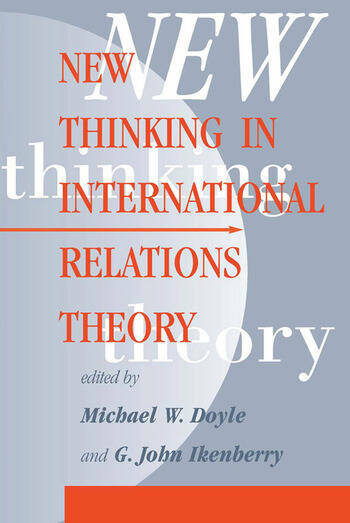 Written for readers with a general interest in and knowledge of world affairs, New Thinking in International Relations Theory can also be assigned in international relations theory courses.The volume begins with an essay on the classical tradition at the end of the Cold War. Essays explore work outside the mainstream, such as Jean Bethke Elshtain on feminist theory and James Der Derian on postmodern theory as well as those developing theoretical advances within traditional realms from James DeNardo's formal modeling to the more descriptive analyses of Miles Kahler and Steve Weber. Other essays include Matthew Evangelista on domestics structure, Daniel Deudney on naturalist and geopolitical theory, and Joseph Grieco on international structuralist theory. * Introduction: The End of the Cold War, the Classical Tradition, and International Change Michael W. Doyle and G. John Ikenberry * Inventing International Relations: International Relations Theory After 1945 Miles Kahler * Post-Theory: The Eternal Return of Ethics in International Relations James Der Derian * Feminist Inquiry and International Relations Jean Bethke Elshtain * Geopolitics and Change Daniel Deudney * Complexity, Formal Methods, and Ideology in International Studies James DeNardo * Realist International Theory and the Study of World Politics Joseph M. Grieco * Domestic Structure and International Change Matthew Evangelista * Institutions and Change Steven Weber * Conclusion: Continuity and Innovation in International Relations Theory G. J. Ikenberry and M. W. Doyle. Michael W. Doyle is professor of politics and international affairs at Princeton University. G. John Ikenberry is codirector of the Lauder Institute of Management and International Studies and associate professor of political science at the University of Pennsylvania. Michael W. Doyle is professor of politics and international affairs at Princeton University. G. John Ikenberry is codirector of the Lauder Institute of Management and International Studies and associate professor of political science at the University of Pennsylvania. Michael W. Doyle is professor of politics and international affairs at Princeton University. G. John Ikenberry is codirector of the Lauder Institute of Management and International Studies and associate professor of political science at the University of Pennsylvania.